DUBAI (Reuters) - The U.N. special envoy to Yemen on Monday said the urgency of accessing grain stores trapped in a frontline position in the port city of Hodeidah was increasing as the food was "at risk of rotting". The U.N. is pushing for the implementation of a ceasefire and troop withdrawal from Hodeidah, the main entry point for most of Yemen's imports, agreed in December in Sweden. Negotiations between warring parties last week produced what the U.N. called a "preliminary compromise" on how to withdraw troops, although the deal has not yet been finally agreed. 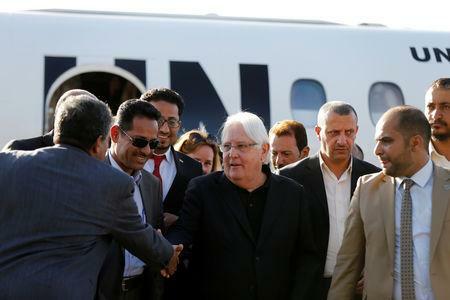 "We emphasize that ensuring access to the mills is a shared responsibility among the parties to the conflict in Yemen. With safe, unfettered and sustained access, the United Nations can make this urgently needed food available to people in need," the statement said.